Ryan Dempster may have been suspended, but he actually saw it as a good thing. The pitcher, who in his last seven starts has gone 1-1 with a 6.81 ERA, took the five-day suspension as an opportunity to hopefully bring his game up for his next start on Friday at home against the White Sox. "My arm is probably benefiting from it," Dempster said according to MLB.com’s Ian Browne. "There's a silver lining in everything. I'm not 26 anymore, I'm 36, so this little bit of a rest is probably good for my arm." Dempster served the last day of his suspension on Sunday. He threw an 80-pitch bullpen session on Saturday. He mentioned that his health has not been the reason for his struggles and took some accountability for his less than satisfactory performance as of late. "Just experiencing poor location of my pitcher's arm. 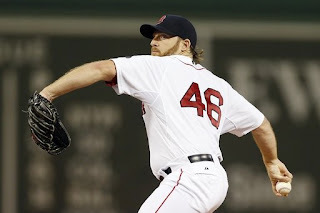 Been working on trying to fix that," Dempster said. "I have to do my job and I have to do a better job than I've done the last few times out, other than the start in Toronto." Dempster of course was suspended for beaning Alex Rodriguez on a 3-0 count, all of which were inside pitches. Many have since voiced their disapproval of the move, including David Ortiz, who thinks Dempster lit a fire under A-Rod. But Dempster said there are no hard feelings. "He has his opinion and it's his right to have every part of his opinion. This is his team," Dempster said. "I'm sure he was probably a little frustrated with how everything happened, and that's OK. We joked about it. We're totally cool." It’s likely that that he’s not so cool with Rays skipper Joe Maddon, who said last week that he thought there was “absolutely zero reason to do that,” according to NESN.